BENGKALIS - People in Bengkalis are so happy because now they can save their monthly expenses of around Rp. 500-700 thousand, thanks to the presence of Energy-Saving Solar Lights (LTSHE) installed by the Ministry of Energy and Mineral Resources (ESDM) in 2018. 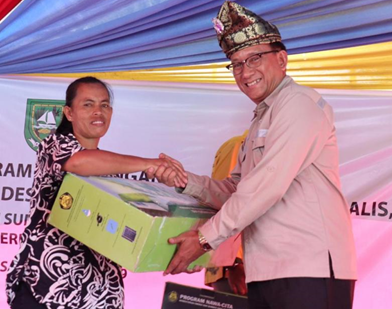 This was revealed by Jasman , one of the villagers who received the LTSHE who was met by the Ministry of Energy and Mineral Resources representatives during the delivery of the LTSHE today (Wednesday, 2/2) in Tasik Serai Village, Bengkalis Regency, Riau Province. "Before there was LTSHE, we used dompeng machines (generators) in every house by buying diesel fuel. Using diesel fuel for a month it could hit 500-700 thousand, it was only from 6pm to 12pm," said Jasman. The existence of LTSHE in Tasik Serai Village is very helpful for the community because it provides information for community activities in the fields and children's learning activities at night. "Previously there has never been any assistance from the Government, only this time, we are very grateful. For the purchase of diesel fuel per month, we have never bought it again, so it can save for other needs," continued Jasman. In line with Jasman, Tasarudin as the Head of Tasik Serai Village was very grateful because the implementation of the LTSHE program was proof that the Central Government was paying attention to the people in remote and dark areas, who had never received assistance from the Government. "Before there was LTSHE it was difficult, because this area was a difficult area to pass through, the road here was muddy and dark and made it difficult," Tasarudin said, "We are grateful to the Central Government for taking care of this remote community because it was completely dark, so now our children can study at night well and easily, "he concluded. LTSHE is a lighting that uses sunlight as a source of electrical energy. 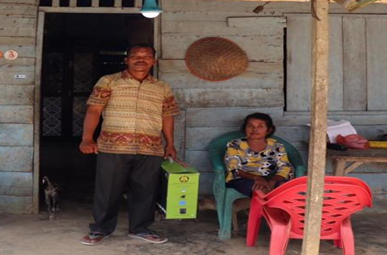 LTSHE is very suitable for areas that have not been reached by PLN electricity. The LTSHE Installation Program is a mandatory manifestation of Presidential Regulation Number 47 of 2017 concerning the Provision of LTSHE for Communities that Have Not Gotten Access to Electricity to embrace people in the outermost, remote, and isolated areas. Tasik Serai Village is one of the recipient villages of LTSHE in Bengkalis Regency in 2018. 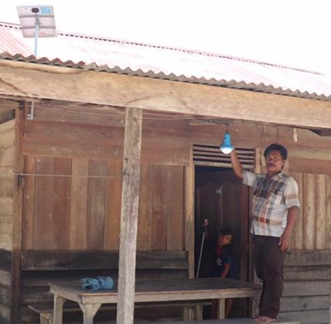 Through the Directorate General of New Energy, Renewable and Energy Conservation (DG EBTKE), there have been 246 installation of LTSHE in Bengkalis Regency spread in Tasik Serai Village, Koto Village Pait Beringin, and Tasik Tebing Serai Village. Installation of LTSHE in Bengkalis Regency is the proposal of the Bengkalis Regency Government and has been submitted to the local Regency Government by Members of the Stakeholder Elements (AUPK) of the National Energy Council(DEN), Abadi Poernomo.